Familiarizing oneself with the particularities of a certain archive is helpful for any researcher preparing to conduct in-country research. But as most scholars who have conducted primary research in China can attest, negotiating access to the archive is just as integral to planning the research trip. When I embarked on my dissertation field and archival work in China, I had a list of library collections, archives, and informants in the art world pertinent to my study, which focuses on the relationship between sculpture and new public spaces after the Chinese Communist Party assumed power in 1949. I was ready for the tedium of archival research. I understood, too, that archives invariably have competing work-related factors that dictate research access, such as preservation of the holdings. Yet on the ground, I quickly realized that I had not accounted for the gray areas and many variables that can characterize accessing archives in China. Below I share three types of institutional archives—museum, provincial, and school—in Sichuan province that I attempted to access in 2013 with varying degrees of success. These three archives were relevant to my case study on Rent Collection Courtyard (《收租院》), a nationally and internationally prominent sculptural group created in 1965 in Dayi County, Sichuan Province. 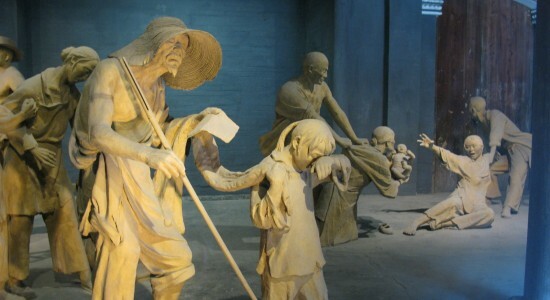 Rent Collection Courtyard was created by the teachers and graduating class of the Sichuan Fine Arts Institute’s sculpture department and the art staff of the installation venue, the then Dayi Landlord Manor Exhibition Hall. During 2013 I was a visiting scholar at the Sichuan Fine Arts Institute. Many of the situations I relate about archival access are not exclusive to China. The nature of my research project on post-1949 China, focusing in particular on artwork implicated in the tumultuous Cultural Revolution, also likely colored my experiences at the archives. Each archive in China also has its own idiosyncrasies related to its particular historical, political, and social identities, as well as to the policies and staff managing it at a given moment, so it is not my wish here to generalize. Rather, I write in hope that sharing the convergence of circumstances I experienced will help other young researchers become more aware and effective in their archival research in China. Hopefully this article will also encourage those more experienced and savvy than me to share their good practices and advice for accessing archives in China. Rent Collection Courtyard was commissioned by the Liu Family Manor Museum (刘氏庄园博物馆), formerly the Dayi Landlord Manor Exhibition Hall (大邑地主庄园陈列馆). This museum is housed in the opulent former home of Liu Wencai (刘文彩), a wealthy landowner in Sichuan who became nationally recognized as the archetypal nefarious landlord through propaganda efforts such as Rent Collection Courtyard, which depicts his alleged crimes against his tenant farmers. In my preliminary research and conversations with researchers of Rent Collection Courtyard who came before me, I found out that the museum’s archives were closed to the public. However, once in China I also learned that it depends on who you know and who is in charge at any given moment. One Chinese historian in the 1990s was able to gain access to the archives because of her stature as a renowned intellectual and the support of the museum director and archives manager at the time, who were sympathetic to the scholar’s research project to uncover how Liu Wencai was villainized. Since the circumstances of the creation, viewing, and national dissemination of Rent Collection Courtyard are central to my dissertation project, I endeavored to gain access to the museum’s archives too. Not having any personal contacts with the museum staff there, I was politely but firmly rebuffed in my initial inquiries in person at the front desk. A few months later I met a museum curator in Chengdu through an American friend. Though she did not know the current director of the Liu Family Mansion personally, she knew the director’s telephone number.Via this channel I was able to set up an appointment and meet the director. The director kindly took the time to discuss with me her views on Rent Collection Courtyard, provided me with some of their current docent material and publications, and then entrusted me to a staff member, who I later deduced was the head of the museum’s public relations. The staff member helped jot down my requests for certain materials in the archives and, after treating me to lunch at the staff canteen, bid me farewell with a vague assurance that she would let me know if they could locate my requested materials. Though having relationships of influence, or guanxi, is known to be important for doing business in China, my failed attempt at accessing the museum archives exposed me to how guanxi can also play an integral part in conducting research in China. This is especially true in museums, which, unlike official archives, do not have formal obligations or regulations governing access to their collections and archives and so can be more arbitrary about to whom they allow access. Further, access may also depend on whether or not material in the archive implicates living people. Over the course of my ten-month research stay in Sichuan, I learned through friends with connections to the Liu Family Manor Museum that a few of the people who were responsible for the decision-making in the museum in the 1960s and 1970s were still alive and would rather not have the archives opened to researchers. Finally, in discussions with Chinese academic colleagues, I found that a number of museums in China have to produce a certain number of publications annually, and so the museum’s interest in publishing its own archival material may also influence how much access to its archives it allows outside researchers. Although this situation did not impact my ability to access the Liu Family Manor Museum’s archives as far as I know, it is a point to consider if you find yourself having to negotiate with a museum’s archives or collections for access. Because the Dayi Landlord Mansion Exhibition Hall was under the jurisdiction of the Sichuan provincial government, my research on Rent Collection Courtyard also brought me to the Sichuan Provincial Archives. As many of the individual archive descriptions on Dissertation Reviews for Chinese provincial archives reflect, the official archives in China usually require a letter of introduction from your danwei, or Chinese host institution, in order to obtain access. Perhaps because the Sichuan Provincial Archives visibly does not receive many researchers from abroad and my research topic is on one of the most celebrated artworks during the chaotic Cultural Revolution (1966-1976), still a sensitive period to research in China, at first the supervising staff member who reviewed my introduction letter was suspicious of my stated intentions as an art historian studying Rent Collection Courtyard. After determining that I needed to consult files from the Culture Department of Sichuan Province (四川省文化厅), the specific provincial bureaucratic organ that oversaw Rent Collection Courtyard, I learned that that set of files had unfortunately been moved recently into the closed stacks. However, through a combination of some verbal insistence and the credibility that the introduction letter from the Sichuan Fine Arts Institute granted me, the front desk staff allowed me to study the index to their holdings from the Culture Department archives to determine if I needed to request anything. Besides providing a researcher access to an official archive, the introduction letter, or more specifically its wording, can also determine which parts of the archive one will be able to access, because the archive staff adjudicates your requests according to what is stated in the letter. This at least was true in my experiences at the Sichuan Provincial Archives, the Guangzhou Provincial Archives, and what documents I could print out at the Shanghai Municipal Archives (in the summer of 2013, when I visited the Shanghai Municipal Archives, they said they now require a letter of introduction, unlike in the past). At the Sichuan Provincial Archives I asked to view a Culture Department dossier from 1966 that was named Rent Collection Courtyard, as well as some other related dossiers detailing the main objectives of the Culture Department in the early 1960s. Since my introduction letter simply read that I was researching Rent Collection Courtyard, the archives manager denied all my requests except the dossier that specifically had Rent Collection Courtyard in its file name. Even when I explained that understanding the context of official art and cultural objectives of the provincial government would be relevant to understanding the creation of Rent Collection Courtyard in the early 1960s, he cited the introduction letter, which did not explicitly state that I was researching the cultural objectives of the Culture Department. Based on this particular exchange, as well as experiences at other official archives, I learned that it may be desirable to have the research description in your introduction letter spell out both general and specific areas you would like to address in your research in as much detail as possible. This will help cover whatever files you may discover and be interested in viewing once you are at the archives. Bureaucracy can also accompany archive work, so patience and persistence are key. Since the archive folders of the Culture Department of Sichuan Province in which the file about Rent Collection Courtyard belongs were in the closed stacks, the archives manager informed me that I would need to obtain an introduction letter from the originating danwei, the Culture Department, approving me to see the file before they could allow me to view it. Therefore, I returned to Chongqing from the archives in Chengdu, obtained a letter of introduction from my host institution addressed to the Culture Department, and then returned to Chengdu to the Culture Department of Sichuan Province offices and presented them with the letter and my request. Thankfully, the Culture Department approved of my viewing the file and wrote a letter of introduction to the archives. Thus, I was finally able to access the archival folder on Rent Collection Courtyard at the Sichuan Provincial Archives. Having guanxi or being able to build on someone else’s guanxi network can make archives (and informants for that matter) far more accessible, as I learned from my experiences at the Liu Family Manor Museum and the Sichuan Provincial Archives. Yet when I attempted to access the archives of the school where Rent Collection Courtyard was created to see if they had any relevant primary materials, my request was dismissed without explanation. Even though the support of my advisor at the Sichuan Fine Arts Institute in authorizing the letters of introduction generally lent me credibility with external institutions, in dealing with the school I had to gain the approval of the school’s own administrative staff member in order to gain access to the school archives, approval complicated by my identity as a visiting foreign scholar. In any case, ultimately the staff member handling my request informed me that the school archives only held materials on an international symposium on Rent Collection Courtyard in 1996. This reminded me that even once accessed, archives are still only as helpful as what they hold. Though it struck me as odd that the school’s archival holdings on the Rent Collection Courtyard were so scant given how integral the fame of Rent Collection Courtyard has become to the identity and national reputation of the Sichuan Fine Arts Institute, it also demonstrates that much of the primary materials from the turbulent 1960s and 1970s have not been handed over yet to institutional archives. Much of this history is still in private hands or has been sold to used bookstores or antique markets, especially during the 1980s and early 1990s, when such materials were considered irrelevant to the new realities of China after the accelerated social and economic reforms of the Deng Xiaoping era. Some of the most important primary documents I found were not in archives, but in antique book markets. Though scouring through bundles of arcane ephemera, books, and photographs from one vendor to the next may seem like futile work, the comparatively easy access and likelihood that one will discover fascinating primary documents that could inspire future research projects in the end makes the effort worthwhile. As all researchers, but especially those fresh from the field or archives, know well, some of the most valuable and intriguing finds are the products of serendipity. Support for Vivian Li’s research in China in 2013 was provided by a Fulbright Student Research Fellowship. Image: Rent Collection Courtyard, 1965, Liu Family Manor Museum, Dayi county, Sichuan. Photo by Author.